Recently, I read on one of the drawing blogs (sorry, I can't remember whose, but if it's you let me know and I'll link you here) that you never really get to know a subject until you've drawn it 100 times. I can relate to that. I know that confidence you get from drawing a subject over and over. So, last week, while I was housebound, I decided to tackle a different subject, instead of my usual still life. I drew my cat 130 times in a couple of days. As you do. Just rough quick sketches. Anyway, back to the drawing project. I'm really happy with the results. At the beginning the sketches were tentative and a little nervous, this is right out of my comfort zone, but I think you can see the confidence growing throughout. 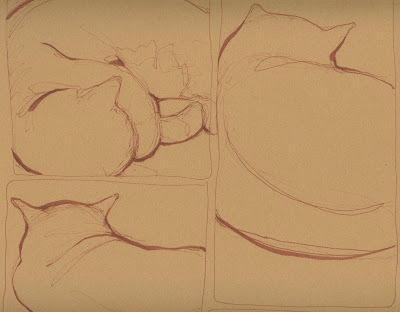 I can definitely say I'm now quite confident at drawing sleeping and washing cats. I couldn't post all of the sketches. As, it would have been the most gigantic post known to man. So I've just posted some of my favourites. But you can see the full set HERE on Flickr. If, of course, you are interested. Another note on this recession. I'm finding that I'm so much less wasteful (is that a word?). I used to spend so much money on pens, art supplies, pens and more pens. I have pencil cases full of unused pens. For this project I dug out pens that I'd never even used before. And, an old practice pad that would never have seen the light of day if I wasn't so poor. Here's that link again to the FLICKR SET. WOW is all I can say! Thank God they sleep so much or it would have been more difficult!!! Great job and an inspiration! Gosh, I feel like I really know your cat now also. lol Great sketches Andrea!! Yes, I am finding lots of art supplies also. Problem is I want to drop everything and try them out again. These are ALL really great, Andrea! And like you, I have become a hoarder of supplies. That, and the old paper I'm using for my art! Andrea this an excellent exercise of patience and love for the cat, the drawing... I am sure you are loving it as much as I did while watching. Great job! Seems you cat didn't sense the searching eyes - or felt safe to go on sleeping. Wonderful sketches! I love these, Andrea--of course. What a terrific project! fun to see all your great sketches --wonderful exercise! say speedy to gt a job! once again you are the best. while i was sick and traveling, i didn't even pick up a pen. you, however, take on a project chose a subject you don't feel confident on and produce excellence. you are a great inspiration! 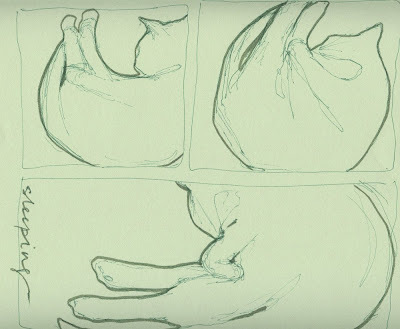 I love your cat sketches. What a great idea and cats are such fun to draw. I've been enjoying your other drawings too. Lovely sketches - it's not often one gets the time to concentrate on drawing a subject so intently, but it's so worth doing. My dogs always sense eyes on them and get up & walk away when I'm sketching. Excellent drawings and concept! It was a great experiment to use all of those old pencils as well. Atleast there was some variety with all of those sleeping poses. Can you tell me what size the drawings are? Wow what a great idea--and I love your line! 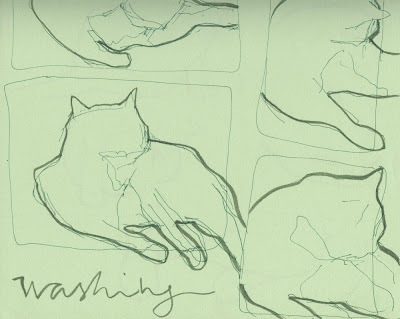 This is a fantastic series of sketches, and a great blog post. 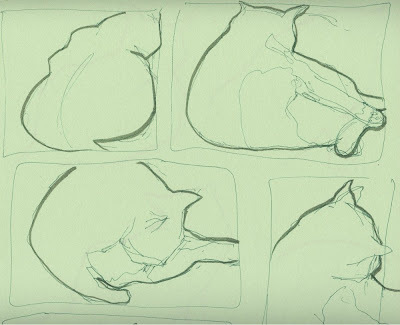 I'm envious, too -- I find drawing cats really difficult. So you inspire me. Fantastic thick and thin line combination! And totally brought out the characteristic of the cat too :) These are just amazing! 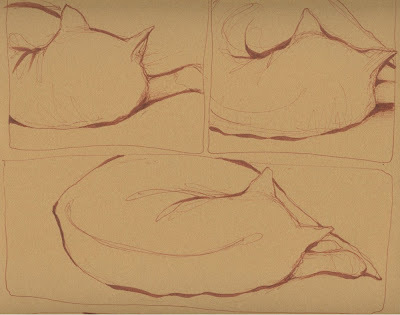 These are wonderful drawings of your sweet cat, Andrea. Although, I do tend to draw my pets a lot, you have surely got me beat! Great project. Thank you all so much folks. I'm glad you liked these. I do too, not all of them, of course. But the ones I posted here. Alissa, I used an A3 paper but divided up into boxes. The first pages I divided up into tiny boxes approx 20-30 per page. Then when I got more into the project I divided the page into 5 or 6 boxes. Camille, nice to meet you. I love this set, every one of them a winner. Such wonderful cat drawings!! What an outstanding exercise, and what brilliant results!! :-)I am all smiles, love these drawings!